Glass marbles are glass that was simply heated to liquid and then allowed to cool to solidity in round molds. Any solid glass object can be reheated to liquid form and poured into shape-forming molds of the artist's choice. The centerpiece of a glass workshop is the kiln, either electrically-powered or powered via natural gas or propane. 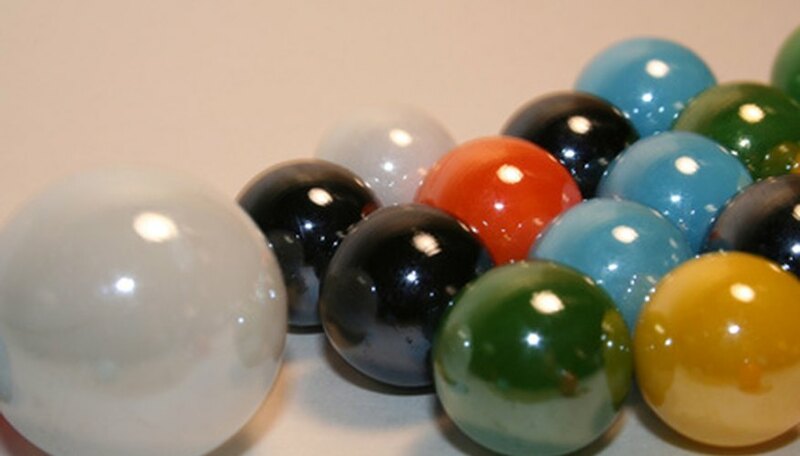 To melt glass marbles, temperatures in the kiln must be allowed to reach the melting point for glass, and then the liquid glass must be poured immediately before it cools. Turn on the power or the fuel supply to the kiln and allow the temperature to reach between 1,500 and 1,700 degrees F, preferably 1,700 degrees which will be adequate for melting down the entire thickness of the marbles. Put on hot-gloves or welding gloves and open the kiln while it is heating and use manual lifting hooks to lift the kiln melting tray from the unit, closing the door immediately so minimum heat is lost. The tray should only be warm and not hot at this point. Load the melting tray with the number of marbles needed to form the new item, but resist filling the tray more than three-quarters full or it may be too cumbersome to pour the liquid glass without spills when removing. Lift the lid of the kiln and use the manual lifting tray hooks to lower the tray filled with marbles into the kiln and secure the lid. Allow just enough time for the marbles to be visibly liquefied. Remove the tray containing the liquid glass from the kiln and quickly (but safely) pour the liquid glass into any desired molds and allow to cool to room temperature. Turn off the power or gas supply to the kiln immediately when finished to conserve energy or fuel. An acetylene torch can, in some cases, produce enough heat to melt glass. However, use of a torch may pose safety hazards due to the pressure of the gas coming from the nozzle which could cause melted glass to splatte and, if any moisture droplets land in the heated glass, a small explosion. This method is not recommended. Hot liquefied glass will burn through all layers of skin and into muscle tissue. Never handle hot glass or metal without wearing heavy heat-resistant gloves.